Get ready to feel at home with this new adventure set in J.K. Rowling’s wizarding world. David Yates, director of the last four Harry Potter films, returns for this new five-part film series, written for the screen by Rowling herself. Fantastic Beasts and Where to Find Them works as an action-filled introduction to a new era of the magical wizarding world, as well as to generations old and new. Following Newt Scamander’s worldwide quest to study and learn more about magical beasts, Newt (Eddie Redmayne) arrives in New York City. Set in 1926, it doesn’t take long for Newt’s beastly companions to wreak havoc on the city, entangling him into some high stakes drama involving the MACUSA (Magical Congress of the United States), a witch-hating Puritanical group, and a stunned No-Maj (Muggle). As much as it is Newt leading us through this adventure, the film entirely owes its charms to the new cast of supporting characters, including the scene-stealing CGI beasts. Katherine Waterson’s Tina is determined, ambitious and the type of woman to balance out Newt’s eccentricities. We see her opposite in her sister, Queenie (Alison Sudol), a dazzling witch who can read minds yet still retains a sunny disposition. This is definitely evident in her interactions with Jacob (Dan Fogler), an aspiring baker/No-Maj who gets tangled up in Newt’s drama early on. And it’s with Jacob that we finally get a new perspective on the wizarding world. A Muggle’s (or I suppose really, No-Maj’s) introduction to the magical world that isn’t one like the Dursley’s is instantly relatable. As shocked and confused he is by the whole thing, he, like us, embraces it eagerly, and Rowling uses that to the story’s advantage, especially at the very end. Like I said at the start of the review, it’s easy to fall right into Fantastic Beasts, like no time has passed since the last Harry Potter film. Much of that does have to do with Yates’ direction, which manages to make this world feel familiar despite being in a different time and place. The speakeasy scene and battle in the subway station are true atmospheric highlights, capturing 1920’s New York City beautifully. Still… would I have preferred another director and slightly different creative vision? Yes, but that’s not so much a rip on Yates, just a desire for something more distinctive. Give or take some pacing issues, Fantastic Beasts sets out what it intends to do successfully, much in the same vein that Harry Potter and Sorcerer’s Stone did. In fact, you may notice some similarities in how certain plot developments unravel themselves. However, unlike Harry Potter, Fantastic Beasts is a darker film that will lead to a film series with wider scope, and frankly, that’s very exciting. One of the main subplots follows Credence (Ezra Miller), a young man terrorized by his hard-rearing, fanatically religious mother (Samantha Morton). MACUSA detective Percival Graves seeks out Credence in hopes of helping him find the powerful creature that’s been disturbing the city. The subtext is heavy in this part of the film and truly indicative of American’s history and societal culture – with the exception of a female president unfortunately. But let me tell you about those beasts… I love them. Do I think we’ll see this much of them in future films? Doubtful. Yet, they truly get their moment to shine here, from Pickett, the sweet Bowtruckle, to the greedy but adorable Niffler. The beasts live up to the film’s title and bring so much fun to what otherwise would’ve been a dark and poorly paced movie. Newt as a character would suffer without them. Redmayne is talented performer, but he doesn’t quite match the charm or screen presence of the rest of the cast. What ends up being one of the more worrisome aspects of the film, it makes me wonder if we want Newt to be one to lead us in the next four films. Maybe it’s how thinly developed his backstory is, possibly something that Rowling is waiting on diving into later, but Newt almost fails to capture our hearts in the way that Harry did. Finally, another thing that didn’t fit in was ***SPOILER WARNING*** Johnny Depp. The actor makes an appearance during a pivotal moment in the film, and this is certainly not the last we’ll see of him. I can’t judge Depp on such a small scene, but knowing the type of actor he is, I can’t quite see him being a part of this universe. Personal scandals aside (but definitely not disregarded), Depp does have the chops for subtlety, and my sincerest hopes is that he plays this character so seamlessly we forget about the international megastar that he is. 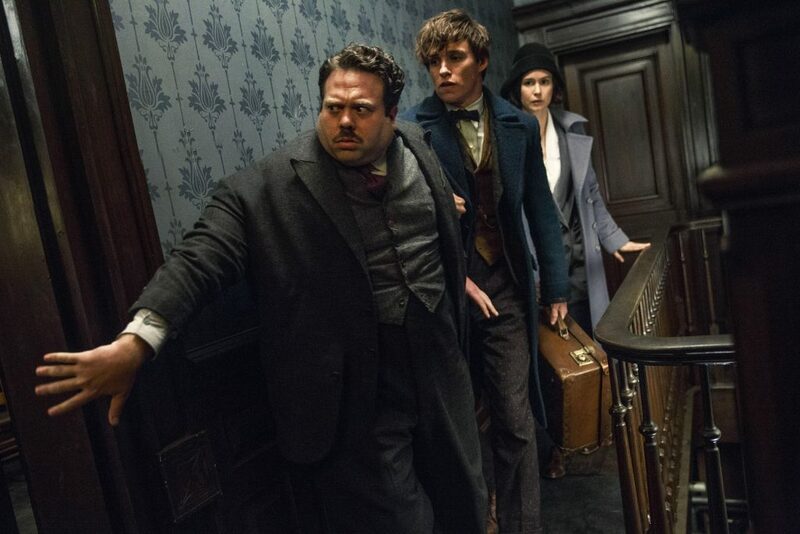 Fantastic Beasts and Where to Find Them is a fine addition to J.K. Rowling’s wizarding world. It will please both fans and new audiences, and while it’s not perfect, there is so much potential. As a Potter fan, I am very happy that Rowling is finally telling this story, and I can’t wait to see it all magically unfold onscreen throughout the next few years. Fantastic Beasts and Where to Find Them arrives in theaters on November 18. Tags Alison Sudol Dan Fogler David Yates eddie redmayne Ezra Miller fantastic beasts Fantastic Beasts and Where To Find Them Featured Harry Potter j. k. rowling Johnny Depp Katherine Waterston Samantha Morton Warner Bros. Previous ArticleAlbum Review: Sleigh Bells - "Jessica Rabbit"